Valles Caldera: The Science: The Science opening sequence. Broxton, P. (January 2008). 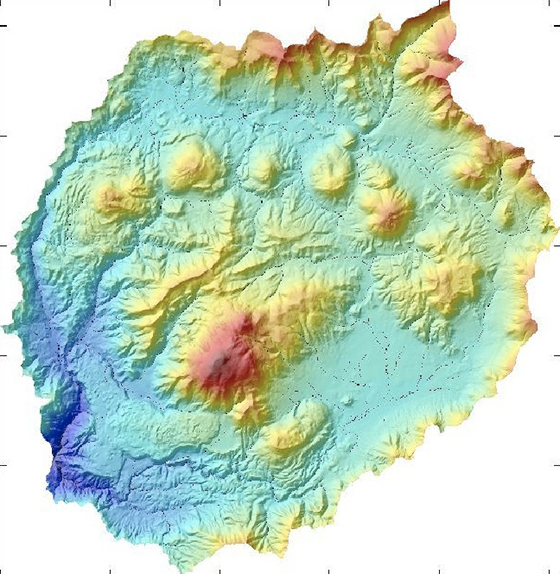 Valles Caldera elevation map. Surface Hydrology Website. Retrieved 5 Aug 13, from http://aspen.hwr.arizona.edu/~surface/fieldsites/valles.html. The best scenario for viewing Valles Caldera: The Science is to show the entire video to your class and then use the specific video clips that are featured with the individual units (Fire, Climate Change, and Geology) to reinforce the unit's labs and activities. Upcoming workshops where The Teachers Guide to Valles Caldera:The Science will be presented. Rhonda Spidell didn't start out to be a science teacher, but her love of learning and fascination with the world around her led Rhonda on a serendipitous journey from Art Education to the nation's capital as an Einstein Fellow at NSF in the Geoscience Directorate (2005). Along the way she received two masters' degrees with one in Elementary Education with Middle School Science Education in 1979 from Georgia State and Master's of Science Teaching from New Mexico Tech in 2000. Throughout her career Rhonda took advantage of every opportunity including: traveling to Australia and New Zealand on sabbatical to study the Earth's systems; serving on the National Research Council's National Science Standards Committee (1991-1994), attending fellowships at Princeton and in Japan (JFMF 2007); and becoming a Presidential Awardee of Excellence in Math and Science Teaching in 2005. After spending 40 years teaching middle school in Georgia and New Mexico, Rhonda Spidell retired from Albuquerque Academy and is now working as a Science Education Consultant. Rhonda's interest in the Jemez Mountains began in 1965 when she was a camp cook and counselor at the Jemez Mountains; Rhonda has hiked, biked, and skied the mountains and valley ever since. The documentary, Valles Caldera: The Science, captures the allure of the Jemez Mountains and creating a Teacher's Guide for the documentary was an excellent opportunity to show the interconnectedness of the Earth and its systems using one our country's majestic landscapes. I was fortunate that the scientists featured in the Teachers' Guide to Valles Caldera: The Science were eager to help by contributing information about themselves and their research. Most of the scientists were a part of the NM EPSCoR project that involved scientists and colleges from around the state of New Mexico in a collaborative effort to look at the impact of Climate Change on New Mexico's mountain sources of water. NM EPSCoR offered their support and expertise in website development by organizing the structure of the website and adding countless links and images. The project investigators (PIs) and their support staff helped to guide the process and distribute information about the website at workshops for teachers held around the state. Thank you all!